Last night I finished the main pieces for my pullover. Tonight, I ‘ll put the shoulders together using the three needle bind-off. I also hope to finish the neckband. Then, I need to blanket stitch the side seams and, lastly, rib around the bottom. It’s a simple two stitch, one row pattern with a knit at the beginning and end of each row. Yarn over, slip slip knit-a no-brainer. If you must knit when you have a roaring headache, this is a great pattern. 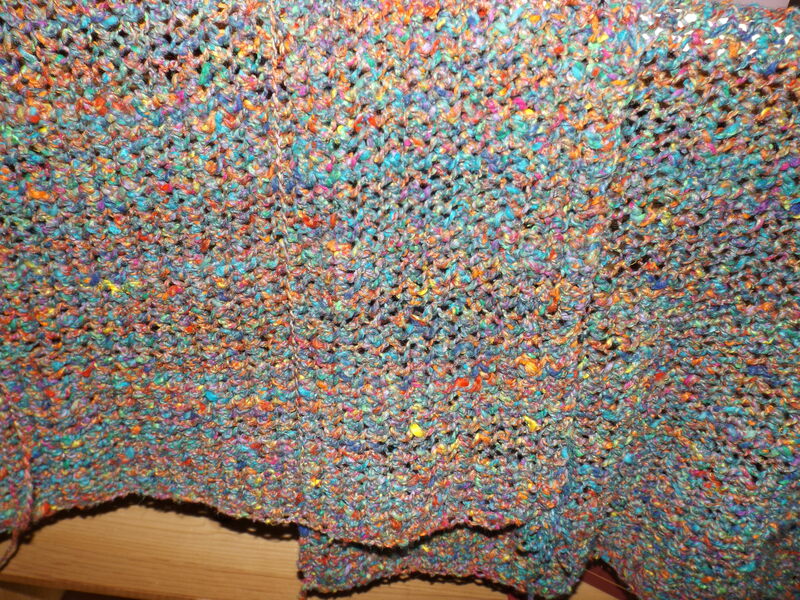 The yarn I used is mostly silk which has very little give. I went up a needle size in order to get the right ‘look’. I’m really happy to be finally completing this top. It should have been finished weeks ago. I had no idea headaches could be so debilitating. This entry was posted on July 8, 2015 at 9:54 pm and is filed under Knitting. You can follow any responses to this entry through the RSS 2.0 feed. Both comments and pings are currently closed. Headaches? Oh no. I can’t do anything with a headache. Feel better soon and happy knitting.